Hi. My very prolific explorer rose has suddenly developed some curled leaves and pink, fuzzy spots. A new ( to me) type of mildew? Please advise. Thank you. Thank you for contacting the Toronto Master Gardeners with your most interesting question. You have not submitted a photo so it is a bit difficult to say definitively what it is that you found on your rose leaf. I am including a photo for you to compare for your reference. 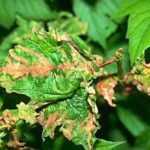 You may be have Erineum Gall on your rose leaf. The Erineum Gall manifests itself as pink fuzz on the leaf surface. Control is not required since the gall does not affect the health of the plant. If after comparing the picture of the gall to your rose you think it is something else please send us a clear closeup picture to help us better identify the problem.